The best and worst of desktop Kaby Lake. An unlocked Core i3 chip seems like a cool idea, but pricing leaves plenty of better alternatives. It's an unlocked Core i3 processor that can overclock to 5GHz. Pricing is lower than Intel's other unlocked CPUs. ...which typically start around the same price. And now for something completely different: an unlocked Core i3 processor. My first impression when I heard Intel was planning on such a part was intrigue—how fast would it be compared to the more expensive offerings? In particular, how would it fare when going up against the Core i5-6600K and Core i5-7600K? I had high hopes… which were then dashed to pieces when I learned the price would be $168, or $179 if you want the boxed CPU cooler. And to add insult to injury, the i3-7350K is currently selling for $185 on Amazon. Let's get the elephant in the corner out of the way, then: There's no good reason to go out and spend that much money on the i3-7350K. Even at $168 the value is dubious, but the i5-7400 and i5-7500 immediately stand out as better overall choices. The problem as usual comes down to core counts. The Core i3 line packs two physical cores and adds Hyper-Threading (aka SMT), while the Core i5 parts have four physical cores but no Hyper-Threading. 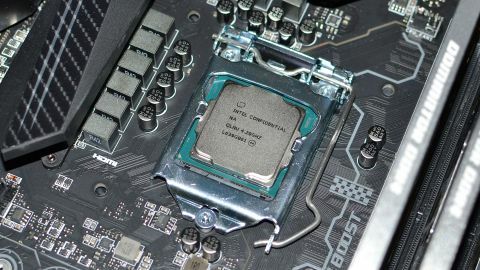 Clock speeds do favor the i3-7350K, but dual-core and quad-core processors have been around long enough that our software actually does benefit in meaningful ways from the Core i5 approach. Our Kaby Lake hub includes additional architectural details and charts, if you're looking for further reading material. In a sense, this is a part that people were asking for after the Pentium G3258 Anniversary Edition—an unlocked Haswell architecture part with two cores and two threads. People loved the fact that you could push the G3258 clocks into the high 4GHz range (4.5-4.7GHz is common), but the dual-core design proved a limiting factor in a variety of workloads. Moving to Core i3 gives it a pair of extra logical cores to help out, which is good news. But the bad news is that the price more than doubles in the process. I would have been far more interested in an i3-7150K priced around $120, even if it only has 3MB L3 cache instead of 4MB. This is definitely a new class of CPU, as previously the only way you could overclock Core i3 is via BCLK adjustments, which didn't always work so well. I'm not sure if Intel has properly locked down the other CPUs this round (I've still got an overclocked i5-6400 using an ASRock Z170 Gaming K6 running at 4.3GHz), but if so then the i3-7350K represents the least expensive way to get into Intel CPU overclocking. Just remember that you still need a Z270 (or Z170) motherboard if you want to overclock. As mentioned in both the i5-7600K and i7-7700K reviews, Kaby Lake makes the most sense when you're building a new PC—I wouldn't recommend upgrading from Skylake to Kaby Lake, or even from Haswell/Broadwell. So let's look at the price of a complete Kaby Lake PC. With reasonable choices on all the components—not too high but also not junk—the total will be around $830 if you go with the Core i3-7350K, compared to $875 with the Core i5-7600K. (If you're looking for my quick picks: Z270 motherboard, 16GB DDR4, RX 470 4GB, 480GB SSD, 500W Gold PSU, and an ATX case—and don't forget the CPU cooler.) At that point, the $45 extra is well worth your time, as we'll see in the benchmarks. There are areas where the 7350K still does well, particularly in the single-threaded Cinebench result. However, if you want to compare enthusiast grade CPUs with unlocked multipliers, the i5-7600K beats the 7350K by over 40 percent on average. For a 25 percent increase in CPU cost, clearly that's the better overall buy. Put another way, if you're looking at older Intel CPUs, the i3-7350K is roughly equivalent to an i5-2500K, both running at stock. That's not a bad result by any means, but we're talking about a six year old CPU, and the difference in launch price is still only about $50. You would have to be using very old hardware for the 7350K to be a significant upgrade in performance. Moving over to gaming, things become a bit more interesting. Games tend to scale much better with clock speeds and efficient CPU architectures rather than core counts. Here, even the stock i3-7350K easily wins out over AMD's current best processor, the FX-8370. This is why AMD CPUs haven't been recommended as the best gaming solution for quite some time. Even games that scale a bit better with core counts like Ashes of the Singularity and Civilization VI favor Core i3 over the FX series. Out of the fourteen games tested, the only two cases where AMD's FX-8370 outperforms the i3-7350K are Hitman and Shadow Warrior 2—and overclocking both chips negates most of the difference. Toss in the fact that FX-8370 can draw 125W compared to the i3-7350K's 60W and things are even worse. For gaming purposes, AMD desperately needs Ryzen to do well. Overclocking the 7350K to 4.9GHz (I couldn't get 5.0GHz fully stable) helps in most games, with Civilization VI, Hitman, and Warhammer all showing more than a 10 percent increase in frame rates. Deus Ex and The Witcher are on the other end of the spectrum, showing no change in performance despite a 17 percent increase in CPU clocks—those two games are GPU limited with any of the Intel processors I've tested. I should also at least mention the integrated HD Graphics 630 performance. I didn't rerun all the tests, but in the five games I checked the i3-7350K is basically equal to the HD 630 gaming performance on i7-7700K, minus a few percent due to the slightly higher clocks on 7700K (1150MHz vs. 1100MHz). You can overclock the HD 630 to 1300-1350 MHz with relative ease as well, which improves things a bit. AMD's A10-7890K has a faster graphics solution, but for gaming I'd still plan on installing a discrete graphics card. The Core i3-7350K ends up as a bit of a perplexing chip. Performance is quite good for a dual-core processor, and in games it comes relatively close to more expensive CPUs… but it's not really that much cheaper, especially if you factor in the cost of a Z270 motherboard. It feels like Intel is reaching on this one, trying to find an untapped market but refusing to offer too much CPU at too low of a price. Simply put, just as I suspected, there are better processors in this price bracket. If you're looking for suggestions, I'd recommend just about any of the desktop Core i5 Skylake and Kaby Lake processors over the 7350K. If you're planning on running stock clocks, you can also save money on the motherboard by going with an H270 or even B250 chipset. There are good motherboards with four DDR4 slots and dual M.2 slots for well under $100, and paired up with an i5-7500 you'd be spending about the same amount as Z270 plus i3-7350K, plus getting two extra physical CPU cores. There's still AMD's Ryzen to contend with, where all the models will be multiplier unlocked. The current rumors suggest AMD will officially unveil the Ryzen models at GDC at the end of February, with 4-core/8-thread, 8-core/8-thread, and 8-core/16-thread parts. The chief contender will apparently be a 4-core/8-thread Ryzen SR3 part, rumored to target $150 at launch. If it hits that price and can overclock to anywhere near 4GHz (which seems probable), and if the 40 percent improvement in IPC compared to AMD's previous architecture holds true, that will be the budget overclocking darling we're all waiting for. As with the i7-7700K and i5-7600K, at this point Ryzen is so close that there's no harm in waiting to see how the chips actually perform and how much they'll cost. Intel is known for being cautious with some of its products. You want a 10-core processor? Yeah, Intel can do that, but it will cost five times as much as the top 4-core consumer part. Now Intel has gone the other direction and released a multiplier unlocked Core i3 part that will likely hit 5GHz, give or take, and it's the same price as Core i5 parts that end up being the better overall choice for more users. The problem is that where I can see a market for the i5-7600K and i7-7700K, i3-7350K is the odd man out. Budget processors can be interesting, but they need to actually be budget parts. The i3-7350K is more expensive than AMD's current fastest APUs and CPUs, and though it's more power efficient, that's not the selling point. If you can only afford a budget PC, built for games naturally, Core i3-7100 shaves enough off the price—without dropping clock speed much—that I'd look there first. But if you're able to afford an i3-7350K, do yourself a favor and pick up a Core i5 part instead. Or wait for Ryzen.